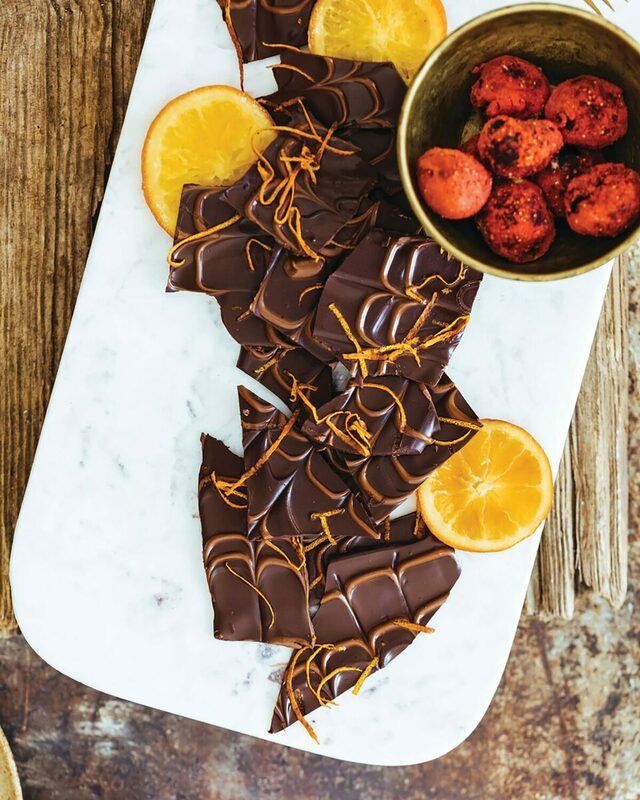 This swirled chocolate bark with orange zest is a great choice for gluten free holiday treats, whether you give it away or you keep it for yourself. MAKES 1 (9 BY 12-INCH) BARK For this recipe, you can hack a double boiler by nesting a medium heatproof bowl inside a pot of simmering water, without the bottom of the bowl touching the water. Also, if you don’t have a zester with channel holes, use a regular zester. Store the bark airtight up to 1 week at room temperature or in the fridge if your home is warm. Line a 9 by 12-inch baking sheet with parchment paper and set aside. Fill the bottoms of 2 double boilers with about 2 inches of water and bring to a simmer over medium-high heat. Lower the heat to medium. Add the dark chocolate pieces to the top of one of the double boilers, add the milk chocolate pieces to the top of the other double boiler, and place each over simmering water. Stir gently until each pot of chocolate is melted. Pour the melted dark chocolate onto the baking sheet and smooth into an even layer with an offset spatula. Drizzle the milk chocolate in thin stripes, either vertically, or horizontally over the dark chocolate layer. Using a skewer or a toothpick, create lines going the opposite direction of the milk chocolate stripes in 1/2-inch intervals to create swirls. Wipe the skewer clean with a paper towel between passes through the chocolate. Sprinkle with the orange zest. Refrigerate until firm, at least 1 hour. Peel the bark from the parchment, cut or break into pieces, and serve.